The internet is beside itself with rumors that the long-sought Higgs Boson has been found — but a representative from one of the teams searching for the so-called "God Particle" says to chill the frak out. So what's going on here? 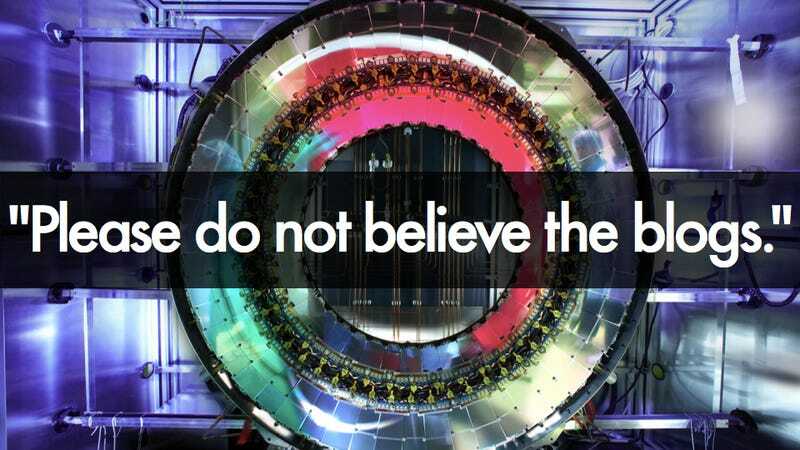 Are researchers waiting for an international physics conference in July to make their big reveal, or has the rumor mill gone out of control? The latest surge in Higgs rumors began three days ago with this blog post (titled, ever-so-subtly, "The Higgs Discovery") by mathematician Peter Woit. The post is full of speculation over a brand new batch of Higgs data, currently being analyzed around the clock in preparation for the International Conference on High Energy Physics (ICHEP) scheduled to kick off in Melbourne, Australia on July 4th. "Exactly how much data they'll have analyzed by ICHEP and exactly what the significance of the signal in the gamma-gamma channel will be... is still to be seen," writes Wolt. "The bottom line though is now clear: there's something there which looks like a Higgs is supposed to look. Attention will soon move to seeing if this signal is exactly what the [Standard Model] predicts." Wolt's post has unleashed the floodgates of the physics blogosphere (warning: here be loads of particle physics jargon). So what is a Higgs supposed to "look" like, anyway? According to data released last December by the Large Hadron Collider's two largest experiments (ATLAS and CMS), a lightweight particle in the region of 125 gigaelectronvolts, which is another way of saying that if the Higgs does exist, it's about 125 times the mass of a proton. Physicists reveal compelling evidence for the "God Particle"
December was the first time both independent experiments had seen a signal at nearly the same mass, which was definitely a good sign that they had uncovered actual traces of the Higgs, and not some anomaly in the data — but even with the ATLAS and CMS results combined, the physicists were only able to achieve what's known as a 3-sigma signal, which translates to a roughly one in 1000 probability that their observations were made by chance. Those might sound like pretty good odds, but to borrow a phrase from NY Times' Dennis Overbye, "you would not board an airplane that crashed every thousand flights." But the latest rumors are that the data being analyzed for ICHEP are turning up 4-sigma signals at ATLAS and CMS. That's still a bit shy of the 5-sigma standard required to announce a bona fide "discovery," but if combined with December's data, it could just be enough. "If the December signal fades, it probably means that the Higgs boson, at least as physicists have envisioned it for the past 40 years, does not exist, and that theorists have to go back to their drawing boards." "This, all agree, is the boson's last stand."